The month of May has been filled joy, happiness, concern and sadness. We had the experience of watching our oldest son graduating from college, and prepare to move to New Hampshire to take a position he’s always dreamed of on a dairy farm. We also experienced a family member who was quite ill and needed to make some life changes to be able to start to recover. A co-worker who is very devoted to his family stood by his father’s side and said his final goodbye. These are changes that alter one’s life. The change from dependency to independence. The change from independence to dependency. The change of fulfillment to loss. We all must face change. We all must deal with the magnitude of how that change alters our lives. We must experience change in our organization. The change that we experience makes us stronger, broader and more relevant to our community. The change many Grange members resist is not life altering. 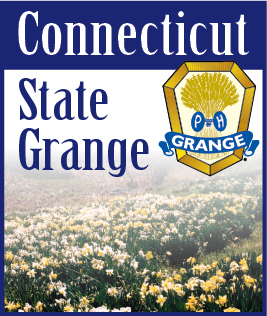 The change many Grange members shy away from has no negative impact on their existence. Where would we be if we had not adapted to change since 1867? Change is inevitable. Change is scary and change is necessary. Like it or not if your Grange is not changing to adapt to the needs of your members and your community you will be changing to irrelevance and extinction. These choices are conscious choices we all must make. Do we want to be part of a prospering organization or do we want to “not rock the boat” or “upset the apple cart” and face the inevitable of closing our doors and ceasing to serve our communities. I encourage every member to step out of your comfort zone and find a way to make change occur ensuring that we secure our place fulfilling the needs of our communities, embracing new members, encouraging growth, leadership and membership development. Let’s make sure the mission of the Grange is advanced and contributes to a platform that strengthens the ability of our successors to pass on what we so richly embrace. Yes, change is scary. Change is intimidating. Change is necessary.